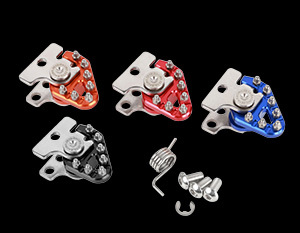 The Zeta Trigger Brake pedal, is the perfect light weight upgrade to your existing OEM brake pedal. It is adjustable giving you position options for the tip making your riding more comfortable and secure plus it come with a brake saver as well. The tip folds inward and springs back, in the event of a crash, preventing your brake arm from being bent. Lastly with the colored anodized aluminum tip it gives your bike that factory look. Zeta the brand that racers trust! After selecting the TIP position, please apply a screw lock agent to be sure to bolt. Black Anodized Finish with Laser Print Logo Thin tip design to prevent it from hitting the ground. Designed to prevent sand and mud from entering the tip folding area from front and side of brake tips. Pins are designed for sensitive pedal control and traction. *New Brake Pedal for Honda CRF1000L part number ZE90-7082 now available.